> Why does the dentist need an x-ray? Can’t he just do a visual examination of my teeth? > Why do they need different types of x-rays? > How much radiation am I actually getting? > What if I’m pregnant? Is it safe for my baby? > How often do I really need an x-ray? 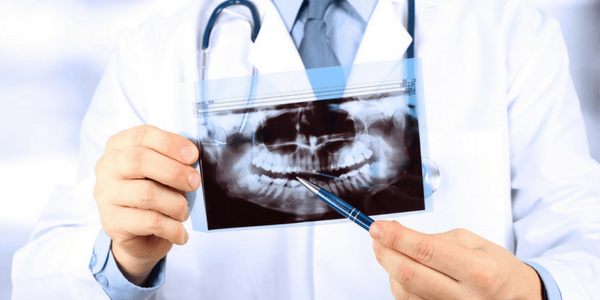 Let’s find out what the facts reveal in answer to each of these questions and then you’ll be in a better position to decide how safe dental x-rays are for you and your family. Why does the dentist need x-rays of your teeth? An x-ray allows your dentist to see bones, tissue, and hidden surfaces of your teeth that they can’t see with just the naked eye during a visual exam. 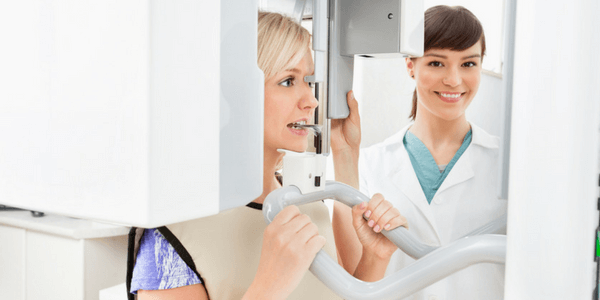 Dental x-rays are invaluable in providing information to a dentist about a patient’s oral health such as early-stage cavities, the presence of gum disease, oral cancers or some types of tumors. If these problem areas continue undetected and without treatment, they can grow into serious dental problems that involve more time, money, and extensive dentistry to fix. Find cavities, even hidden ones. Look at the roots of your teeth. Check the health of the bone around and beneath your teeth. Check on the development of erupting teeth. Monitor your overall dental health. Why does the dentist use different types of x-rays? These x-rays focus on only one or two teeth at a time. A periapical x-ray looks similar to a bite-wing x-ray, but it shows the entire length of each tooth, from crown to root. Extraoral x-rays are made outside the mouth. These are considered “big picture” x-rays because they not only show the teeth, they also provide information on the jaw and skull and are often necessary for the effective treatment of TMD/TMJ. This x-ray captures the entire mouth in a single image, including the teeth, upper and lower jaws, surrounding structures and tissues and requires a special machine. The benefit of this type of x-ray is that it eliminates the need for multiple x-rays. Digital radiographs are the newest x-ray technique used by dental offices. Standard x-ray film is replaced with a flat electronic pad or sensor. The image is transferred digitally into a computer, where it can be viewed on a screen, stored, or printed out. Even though digital x-rays produce lower levels of radiation than standard x-rays and are considered very safe, dentists still take necessary precautions to limit the patient’s exposure to radiation. These precautions include only taking x-rays that are needed, and using lead apron shields to protect the body. How much radiation are you getting during an x-ray? Dental x-rays are one of the lowest radiation dose treatments performed. A routine exam, which includes four bitewings, is about 0.005 mSv. That’s about the same amount of radiation you’d get on an average day from the sun or about the same amount of radiation exposure from a short airplane flight of 1 or 2 hours. A panoramic dental x-ray, which goes around your entire head, has about twice that amount of radiation. Are x-rays safe for pregnant women? Routine x-rays can be postponed until after the birth. But if x-rays are necessary because of a needed dental procedure that can’t be postponed, the American College of Radiology says that no single diagnostic x-ray has a radiation dose significant enough to cause adverse effects in a developing embryo or fetus. And the fact is, with dental x-rays, there is hardly any exposure to radiation to any other part of the body except the teeth. How often do you need an x-ray? How often dental x-rays should be taken depends on a patient’s oral health condition, age, risk for disease and any signs and symptoms of oral disease. The American Dental Association’s long-standing position is that dentists should order dental x-rays for patients only when necessary for diagnosis and treatment. And, of course, your dentist should be following the procedures recommended by the ADA to minimize radiation exposure. This includes the use of abdominal shielding (such as protective aprons). Also, the ADA recommends that dentists use E or F speed film for traditional x-rays, the two fastest film speeds available which lessen the amount of radiation needed for a good picture, or that they use digital x -rays. If you have questions about the necessity for an x-ray ordered by your dental team, talk with them about why they feel the x-ray is needed. In the final analysis, you and your dentist must weigh the benefits of having an x-ray against the risk of minimal radiation exposure.